It is known to all the Bicolanos the folklore of Mount Mayon as formed because of a Romeo and Juliet type of love story. Legend has it that Daragang Magayon- literally Lady Beautiful, from a ruling family of Bicol province - fell in love with a prince who was from a clan at war with her own. Their families forbade their passion, so they fled. Tribal war ensued, prompting the lovelorn couple to commit suicide together at a site now marked by the volcano. More lyrical versions of the tale insist the site is a perpetual combination of beautiful Magayon - the volcano- wreathed in white clouds representing the prince. During eruptions, some older people say they can hear the volcano crying from a voice of a male and a female. Mayon, is an active composite volcano (conical volcano built up by many layers (strata) of hardened lava, tephra, pumice, and volcanic ash) in the province of Albay. Mayon gained the recognition as the "perfect cone" because of its almost symmetric conical shape. The mountain is a national park and a protected landscape in the country proclaimed as Mayon Volcano Natural Park in the year 2000. Mayon is the main landmark of my home province of Albay, rising 2,462 meters (8,077 ft) from the shores of the Albay Gulf about 10 kilometers away. 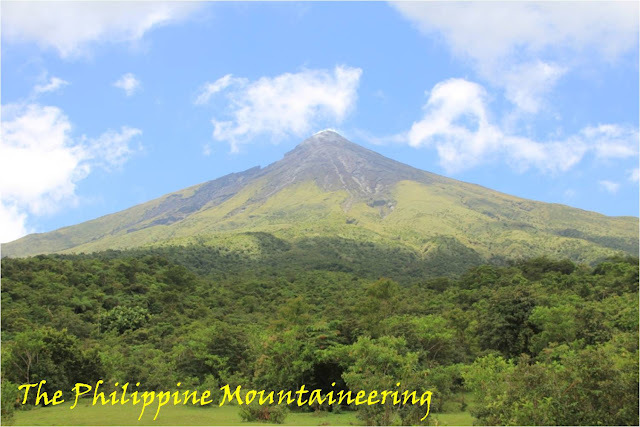 The volcano is geographically shared by three cities of Legazpi, Ligao and Tabaco and five municipalities of Daraga, Camalig, Guinobatan, Malilipot, and Santo Domingo which divide the cone like slices of a pie when viewed from above. Mt. Mayon gained popularity both from a Filipino and also with foreigners for being the most active volcano in the Philippines. Mayon had erupted 47 times in the past 400 years and the last recorded major eruption was in 1993 and the last recorded major activity was in December 2009. 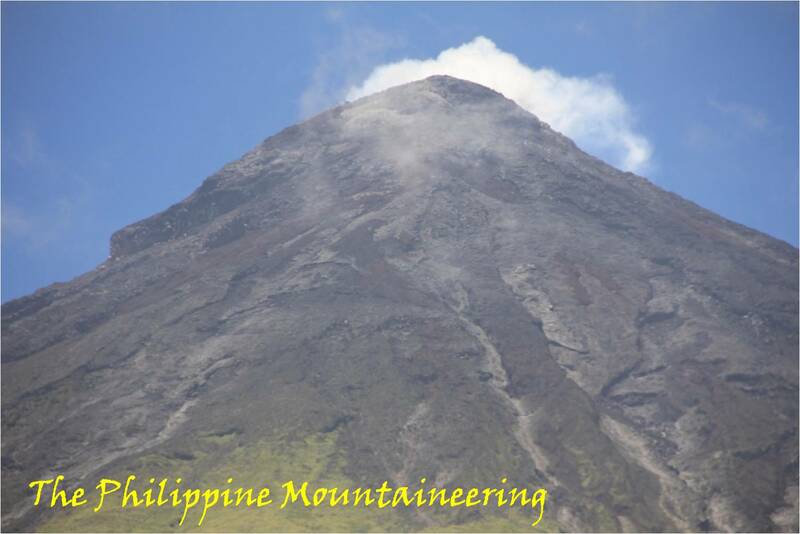 This majestic mountain is one of the known mountains and peaks in the Philippines. Currently, this is the cover photo of Lonely Planet Philippines edition for 2012. One of the notable quotations of Sir Edmund Hillary the legendary Pioneering Conqueror of Everest is, "I am a lucky man. I have had a dream and it has come true, and that is not a thing that happens often to men." To climb Mt. Mayon for the second time is a blessing for me. I am blessed to have an opportunity once more to be on my home province Albay, to see once more the community who shared their love to me and also the friendly membership of MOGA (Mayon Outdoor Guides Association). I waited more than a year to make this climb possible. Last year I shared the cry of my heart to the members of Alliance Mountaineering and Outdoor Society or AMOS , the desire to be at the top of Mt. Mayon. Before my second climb to Mt. Mayon it is still clear to my mind how heavy the rain was when I first attempted to reach the summit. After my 2011 Mt. Mayon experience I looked for mountaineers who are planning to climb the said mountain. Aside with my co-members in AMOS there were numerous individuals who stated their desire to climb with us but only few of them contacted Kuya George. As preparation for the climb I pray for GOD's provision of good weather since December of last. The AMOS officers marked April 4-6 as the date for Mt. Mayon. The said dates also were consider for two reasons first is the availability of the members for the climb due to holy week holiday and the consideration of full moon for lesser possibility of raining according to kuya George . Four of us from Alliance Mountaineering and Outdoor Society or AMOS decided to climbed Mt. Mayon. I am blessed to be with Kuya Ariel, kuya Nestor and Gilbert. Going to Legazpi City in holiday is a serious decision and must prepare a lot most especially on the transportation aspect. Due to budget constrain we only booked a week before the said schedule of climb at it was a tough task for me. I am the in-charge for the transportation and I have to buy bus ticket. I spent my whole day just to purchase ticket, I've been to Cubao and Pasay bus terminals bound to Southern part of the country and there all ticketing booths posted "FULLY BOOK from April 3-6." I was shocked in Pasay I talked to lots of bus dispatchers aiming to get some information where I can get an alternative bus lines. My last bus line for our booking was Philtranco, and it was the same experience-fully booked. I ask the security guard of the said bus line if he knew any alternative bus and he gave me the number of Amihan Bus Line . Amihan is a sister company of Philtranco and the terminal is in Cubao along EDSA. Thank GOD for the blessing there were only six sits left at that time. It was a tiring experience to have a land travel from Manila to Legazpi if the bus is only moving for 40 km/h. It was turtle-like travel due to some processions and road repairs along Quezon province. The total travel time from Manila- Legazpi was 13 hours. We stayed in kuya George residence in the evening. Early moring of the first day of the climb we met kuya Clendo Maralit, an Australia- based Filipino Civil Engineer and Arne Buere a Legazpi City-based tri-athlete and mountaineer. We took jeepney in front of Aquinas University to Barangay San Roque of Malilipot, Albay. It was raining when we reach the Barangay hall of San Roque, there we met all the support crew of the climb- the assistant guides from MOGA. We also registered for Php 20/pax. 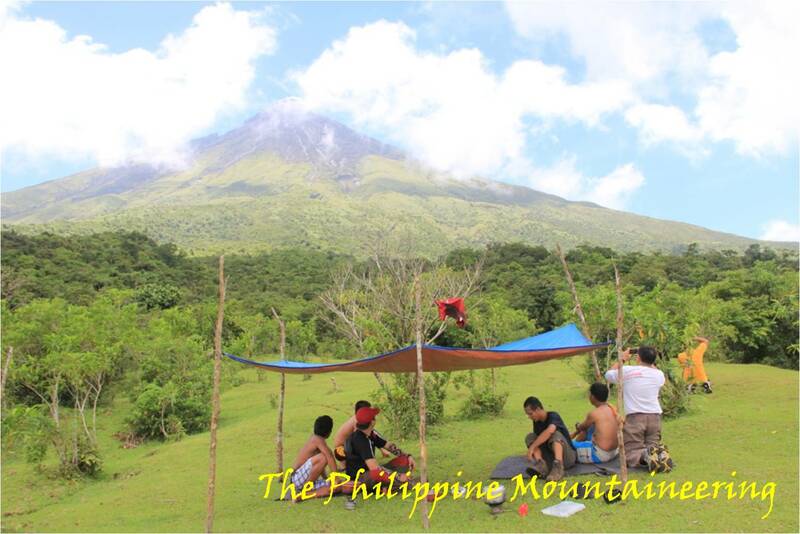 We started climbing at exactly 9:00 in the morning and we reach the first camp site the Toril Camp before 12 noon. It was 5 kilometers walked from the last community to Camp 1. We took our lunch in Camp 1 and the weather was favorable of climbing. The LORD gave us the opportunity to take photos of Mt. Mayon's perfect cone while we are enjoying our stay in camp 1. After almost two hours of stay and picture takings, we ready ourselves for two more kilometers to Camp 2. The trail from Camp 1 to Camp 2 is the forested area of the mountain. Tall trees, wild berries, some flora and fauna are the highlights of the two kilometer trail. We reached Camp 2 as early as 4:30 in the afternoon. Being on the second Camp before sunset is a good idea and also there would be a possibility to see the shadow of Mt. Mayon covering the area of Malilipot, Sto. Domingo and Bacacay. We hold our evening devotion before 7:00 in the evening for as to be ready for early morning assault toward the summit. We cooked our breakfast together with our pack lunch at three in the morning. We left Camp 2 as early as 4:30 in the morning. One of the best features of climbing Mt. Mayon is the safety aspect. All of us wore helmet and the MOGA support crews brought 50 meters kern mantle rope. The gully fronting Malilipot is the trail going to crater. The trail was too acclivitous. Kuya Clendo and the assigned assistant guide to him backed to Camp 2 after an hour of walking. After almost three hours of walking I saw a rock formation and the guide called it as "rabbit ears." From "rabbit ears" going to crater summit is only a kilometer away. From rabbit ears until to the last huge rocks formation which I gave the name "George monument" the trail is exorbitant due to lose rocks. From "George monument" is the start of the known as the “George steps." From George steps 400 meters crater is only 400 meters away. From George steps to crater rock and rope climbing will be available through the help of strong MOGA members. The sea of clouds from rabbit ears to the crater is highly see-able. We reached the summit at exactly 9:00 in the morning. Due to knee and muscle problems one of our companions did not make it to the summit. The smell of sulfur in the summit was disgusting. Truly the LORD is amazing, wonderful and powerful Creator. We head back to camp 2 for almost an hour of stay in the summit. As we go down kuya George and I agreed to measure the trail linearly from crater to the jump-off using his 50 meters kern mantle rope. The use rope while descending from the crater was a big help. This is my first time to climb wearing helmet at first it was a graveling but I appreciated the helmet when loose rocks from small to big going down towards me. Climbing Mt. Mayon is a misnomer for lots of mountaineers, for them is was not that tough but for me Mayon is one of the toughest mountains I climbed. Staying in Camp two at night is the time for overlooking wherein the lighted areas of Legazpi from South down Tabaco City to the north. On our third day some of us woke at 8:00 in the morning due to two hours of rain. Then after fixing our stuffs and equipment we head back to Camp 1 and continue our yesterday's activity of measuring the trail from crater to the last community. Due to trail measurement we arrived at Camp 1 before 12:00 in the afternoon, we also took our lunch there. The trail from Camp 1 to the jump-off was shady. I enjoyed the tiring task of measuring the trail, thank GOD for the provision of the spring water source in the middle of the trail from Camp 1 to the jump-off. Truly the Mt. 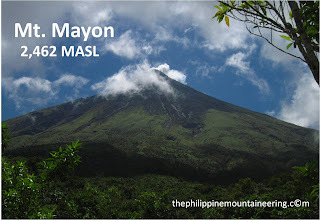 Mayon climb is a blessing for me- to check one of the must climb on my wish list and also to be with Kuya George in measuring the trail distance of the trail of Mt. Mayon of 9.35 km. Mt. Mayon is the perfect cone mountain a perfect destination for every mountaineer and outdoor enthusiasts wanting to experience grievous activity. 1. Back to Manila- the last trip of bus from Legazpi to Manila is 6:30 in the evening. 2. Go for Side trip- Legazpi City is the gateway of Bicol Region's tourism you can explore more mountains or go for some beaches (black or white sand). Try to consider going to Donsol, Sorsogon for Butanding watching. - No helmet no climb in MOGA's jurisdiction. - Going to Legazpi via plane is also available daily. 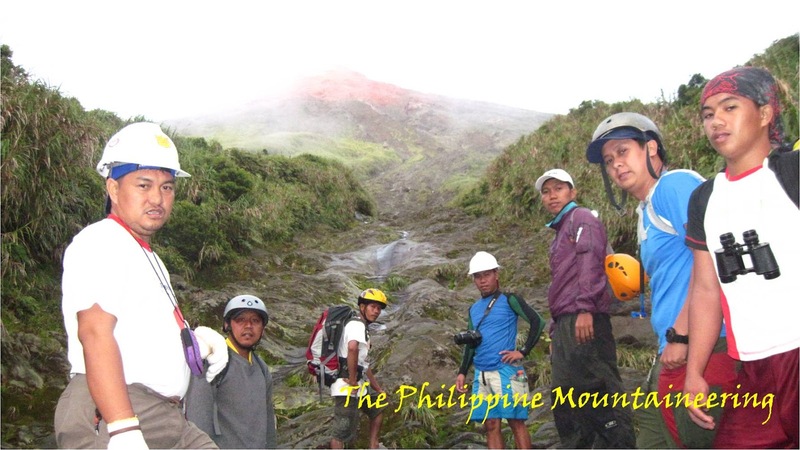 Beware of some individuals and tour guide agencies which offers possibility of breasting the summit of Mayon. One of the known money-making person is Mr. Bayron Cepria who's facing some notable complain from local and foreign Mayon visitors. Ayos yun ah. Nagsukat kayo ng mano-mano? akala ko gps yung ginamit nyo hihiramin ko sana. Well done to you, Manoy George and the rest of your group. opo, mano-mano ang ginawa naming pagsukat sa pamagitan ng 50 meters na tali ni manoy George. Naawa nga ako sa tali kasi putikan pagkatapos pero masya naman sya kaya pagbalik namin sa kanilang bahay nilabahan nya agad.